Our beautiful redbrick and fieldstone heritage building was constructed in 1882 for Roderick Finlayson, a man considered by many to be “the father of Victoria”. Originally built as a ship chandlers and provisioners, the building sat next to the now demolished Hudson’s Bay Company warehouse. It is one of the finest and largest examples of fieldstone construction still standing in Victoria. Born in Scotland in 1818, Finlayson came to Vancouver Island in 1843 at the age of 26 as an officer for the Hudson’s Bay Company. He accompanied James Douglas in the selection of the site for Fort Victoria, and went on to become on of the very few men to see the evolution of Victoria from bare land, to its transformation into the bustling capital of British Columbia. He saw the decline of the fur trade and the boom of the gold rush, and witnessed the British crown take over the newly settled Vancouver Island as a colony in 1849. 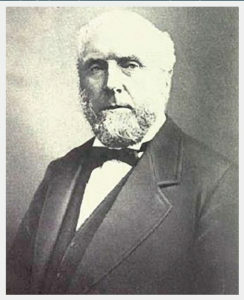 Finlayson served the on the Legislative Council of Vancouver Island from 1851 to 1863 and also served a term as Mayor of Victoria in 1878, during which time he commenced the building of Victoria City Hall. In the spring of 2017 South Island Hospitality Ltd. took over this historic property and christened it “Finn’s” as a tribute to this great man and the legacy he created for future generations.